That we live in an age when you can purchase fiction published by small presses on the other side of the world is a wonderful thing; the twenty- or thirty-dollar risk you take is that the work turns out to be purely local in interest, that topicality was the reason it was published, that the ‘what’ and ‘where’ were more important factors in the decision to publish than the ‘how’. 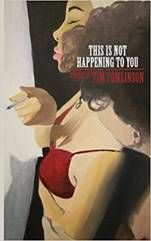 This is Not Happening to You is a collection of short stories by Tim Tomlinson, a New York fiction writer and Professor of Writing. It is published by Winter Goose Publishing of New Hampshire and it will cost you $26.20 from the Book Depository AU. Potential buyers can rest assured, it is not a book of purely local, New England interest. There are nineteen stories in the collection and I dislike generalizing when talking about literature. If the word count for this review has been set at about a thousand, an equal treatment of each of the stories would equate to about fifty-three words per story. Which would be a challenge, especially if each of these mini-reviews were to avoid recounting the plot. There’s not much for it but to admire the general sheen on all these stories – matt black or, better, stainless – and single out a story or two for extra attention. That sheen. I’ve seen prose described as ‘sharp’ and ‘razor-sharp’ and ‘incisive’ and ‘acidic’; I’d go so far as to say that reading Tomlinson’s prose is like licking something bitter from a very sharp knife. I feel something, though I’m really not sure how much pleasure I take in it. If you’re looking for an uplifting, funny, or even-in-the-slightest-bit sentimental book, this is not for you. The term dirty realism (Buford 1983) is thirty-five years old and has an almost quaint ring to it now, detached by time and fairly localized; it wouldn’t do justice to This is Not Happening to You to include it under dirty realism’s ratty and stained banner (made of a bedsheet, one imagines). With a half-dozen exceptions, these stories have a similar focus on the quotidian doings of the morally, romantically, or financially down-and-out, and are similarly seamy, but they advance into what might be termed ‘nasty realism’, so hard and savage are the characters. To be clear, none of the stories are any nastier in content than, for example, Raymond Carver’s ‘Popular Mechanics’ (1974) or ‘Tell the Women we’re Going’ (1974) (Carver 1989), though they are somewhat less tragic. That lack of tragedy is due to the almost pathological cool the characters display. There’s no way under their skin unless it is by violence. Finishing Tomlinson’s book, it was a strange thing to be looking back at it for characters with whom to empathize: I felt as one of those early, scandalized readers of Madame Bovary (1856) might have felt, complaining of the desolation, pessimism, and lack of even one character the reader could love. Wondering where the empathy was to be found in ‘Trap’ and in the entire collection made me feel like a naïve reader. And the grudging acceptance of that naivete encouraged the adoption of a different viewpoint. A broader mode of appreciation. These are hard stories with a metallic sheen, models of concision, of synecdochic characterization, of rapid-fire, richly polysemous dialogue. But the greater value of the collection (for anyone who is not studying the craft of fiction) is in the saddening reminder that literature is powerless to reach some people. They are immune to words, their will is immutable, a short story will not bring them into the fold. If there were some sentimental ray of light visible here, it would only be comforting the converted who have already purchased this remarkable book. Barrie Sherwood is Assistant Professor in the School of Humanities at Nanyang Technological University, Singapore. He is the author of two novels, The Pillow Book of Lady Kasa (DC Books, Canada) and Escape from Amsterdam (Granta Books, UK) as well as works of short fiction and non-fiction in various magazines.